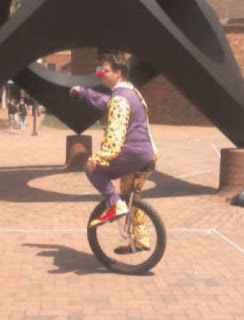 Cel phone blindness: Did you see the unicycling clown? Researchers at Western Washington University recently conducted a study to determine the level of distraction provided by cel phones on walking and driving. The first part of their study was pretty basic: observing behaviours of people walking and talking on cel phones vs other distractions (MP3 player, another person, or without distractions). Results weren't all that surprising: "cell phone users walked more slowly, changed directions more frequently, and were less likely to acknowledge other people than individuals in the other conditions." It's the second part of the study that interests me more. The one where they put up a distraction. A BIG distraction: "a brightly coloured unicycling clown." And you know what? The vast majority of cel phone talkers DIDN'T NOTICE HIM. Researchers said, "people using a cell phone may be less likely to notice new and distinctive stimuli, a phenomenon known as inattentional blindness." In fact, they concluded "engaging in a cell phone conversation results in poorer driving performance than being legally drunk." And before you start asking, what about talking with another person in the car with you? Apparently they provide the advantage of a second pair of eyes since they have a vested interest in helping you drive better (according to the researchers). You know, since they'd like to survive the ride with you. Makes you rethink your use of bluetooth tech, doesn't it? This study will likely be cited more and more as cities start to outlaw any cel phone use in cars. Really, though. A unicycling clown. Whodathunkit? For more on this study, "Did you see the unicycling clown? Inattentional blindness while walking and talking on a cell phone" review the abstract or download the PDF as published in the journal of Applied Cognitive Psychology.